Established in 1961 in Montreal, Canada, the brand’s mission was to create comfortable, versatile footwear that would offer unbeatable protection against the cold, wet Canadian climate. Today, La Canadienne is recognized worldwide not only for their unbeatable protection against the elements, but for their fashion forward thinking, ethical practices, and ability to make remarkable footwear. La Canadienne products are crafted by skilled craftsmen using only the finest Italian materials and are guaranteed waterproof for a period of six months. 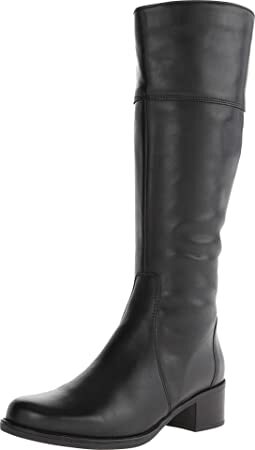 Beautiful leather dress boot; however, I was looking for something with a thicker lining and more insulation. There is really no insulation in these boots. So sadly, I am returning these lovely boots. These boots are just not well made. The sizing is odd: they are very long and narrow. Also the heels are uneven, so the boots push your foot in as you walk. Really a poor showing by la canadienne. After foot surgery last fall I’ve been forced to retire some of my favorite shoes and boots. Now I’m looking for new favorites. 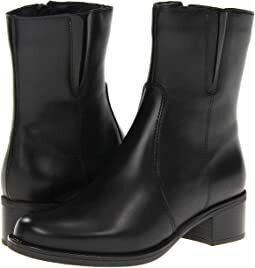 These boots look sleek and are more comfortable than I expected. They are a bit narrower than sized, but I listened to reviewers and bought a wider size than usual. The WW fits just fine and provides enough space to baby my reconstructed foot. I almost wish it were still winter so I could start wearing them. The boots fit pretty well, maybe just a little wide. It did not provide molded cushioned arch support foot bed at all . It felt like foot just plopped onto flat surface . The shearling lining was beautiful and luxurious and the exterior suede beautiful as well . No inside ankle zipper was a problem because had to carefully lace up every time . Also the lace holes were wide apart which made the foot look clunky and wide , as opposed to elegant . It’s better for lacing holes to be less wide apart . 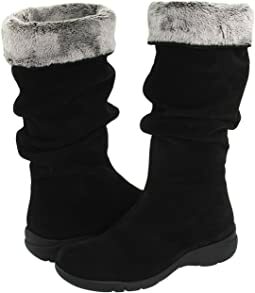 I loved the promise of these 100% shearling lined but waterproof boots in a beautiful suede.. but I had to admit they were not comfortable , not supportive of foot , and required a zipper for ease of getting in and out of . 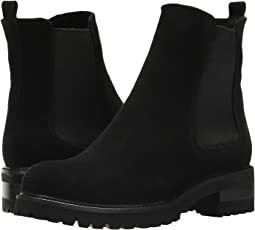 I would love to see these boots in a blue suede or pebble grain waterproof leather , with side zipper and lace holes not as wide apart exposing so much tongue of the boot. 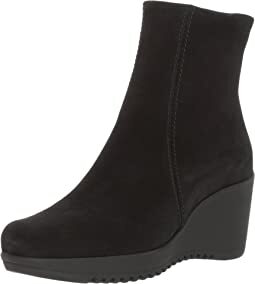 A more defined heel would probably make the boot feel less flat and chunky . I wanted to love these. 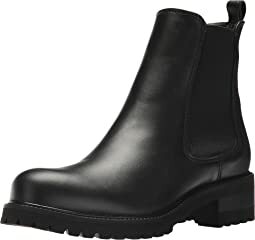 I normally wear a 6.5-7 W. I bought the 6.5WW based on reviews and the length is at least a full size too long. The width would have been ok, but very narrow for a WW, felt like a slightly wider normal (B/medium) width. I might try a 6WW if available. I have an older pair of La Canadiennes and didn’t have this problem. 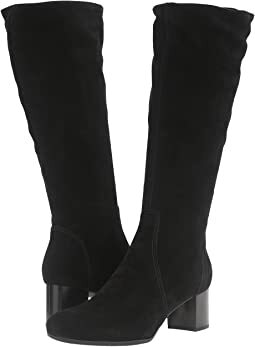 I wanted to love these boots, but they just miss the mark.I ordered the black suede, which I thought would be cute with skirts and leggings, in a 9 1/2 wide. The width was okay, and the heel was nice and trim, like I need, but in comparison the shaft was huge. I have a good inch of material floating around my calf and it looks ridiculous. These are not my first pair of Canadiennes, and I expected them to be more like my old pair. These don't have much pizazz, which I could live with, but their line just seems to be off. They don't feel right when I walk, and seem to tug and pull where they shouldn't. They also have a very uncomfortable footbed; no padding at all. 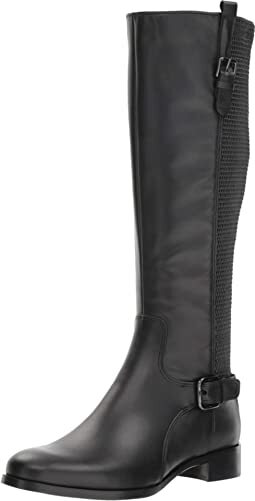 Just for reference I noted that the Jennifer has a smaller shaft, but unfortunately they were out of stock in my size. 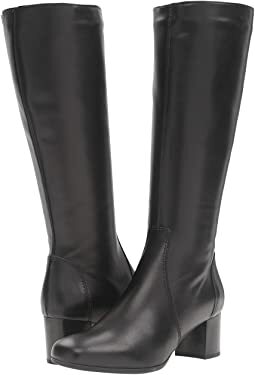 I'm not willing to pay this much for boots that are so much off the mark, even if I am desperate for a new pair of black boots. These boots are incredible. I have the 8WW. The toe box is wide enough for my duck feet but the heel is still nice and snug. I have thin to average calves and they zip up perfectly. This is my second pair. They are soft, comfortable, and look great. I wore the first pair to work almost every day for 5 years before they gave out (had them reheeled once). They are pricey but you get your money’s worth out of these. Very comfortable especially with a square toe. Fits true to size. This is a clean boot. No embellishments. I bought the suede. The heel does not have suede on it. The calf was/is a little snug, but with wearing them just sitting around they stretch fine. I'm 5'7" and I wish they were a little taller, but I'm keeping them. I do like knee high boots almost to the knee but most boot makers don't make them that way unless they're "over the knee." Love these boots. They are extremely comfortable, stylish and well made. I’ve received a ton of compliments on these boots since I started wearing them. Highly recommend and will definitely buy more from this brand! These are my style and come in WW, so I bought them despite the price. 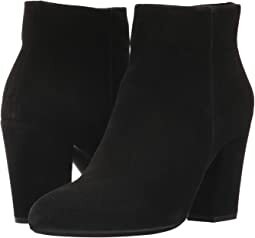 I have very wide feet and would love to find a company that makes really cute boots in my size. I ordered the 8 WW and felt they were a little narrower than I'd like. Right now I am only wearing them in the house because I'm not 100% percent sure I'll keep them. If they were a bit cheaper, I'd just accept the breaking in process and won't even think of returning them. It's a little frustrating, I bought three pairs of shoes at 8 WW (all theoretically EE) and one was so narrow I couldn't get my foot in at all and one was so comfortable that I walked around Manhattan the first day wearing them (Propet's Waverly! ), while these fall into the middle. Now I'm really an EEE (but the only shoes you see in that size are horrible), so if you truly measure in the EE range, these might be fine. I also think they could use a little more arch support (I think I have averagely high arches). They look very cute and I like that you can adjust how they fit your ankles because they lace up (they still have a zipper on the side which detracts for the look but makes getting them on and off much easier). I like the heel size. The leather is nice. I would recommend these more for their looks than their comfort though. These boots are awesome! They are beautiful, the stretch make it possible to fit my largish calves, and the wide choices mean my toes have plenty of room. They run a little long, I am usually a 7, and the 6.5 fits great. I wore them all day straight out of the box at work today, and my feet are happy! These are gorgeous boots, but they were pressing down on my toes. The buckle on the outside of the calf made too much of a lump when I pulled my pant legs over the boots. Unfortunately, I don't want to put all my pant legs inside. I sent them back. I have many pairs of La Canadienne. So worth the money. 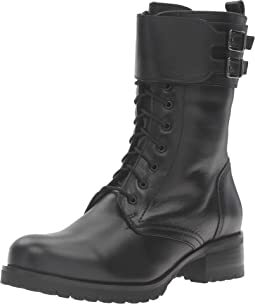 These are great boots. Fit is true to size. Black suede. Square toe which his the best for me when wearing a boot. Walking a lot, your toes tend to hurt and get crammed in anything such as an almond or pointy toe. Remember whenever you have a heel your foot always slides forward a tiny bit. They're a little tight around the calf but just wearing them daily sitting, stretches them out. You can pull the zipper up in little increments daily. I'm not wearing them out yet because I'm waiting for a notification "back in stock" for the "Jenna." The shaft in the "Jenna" appears to be a little taller. I like my boots to almost fit up to the knee. I'm 5'7". I'll wait a while. If it doesn't come in I will definitely keep these. Just wanted to compare the two. I wear an 11m. In all the La Canadienne shoes I have, I never had to order another size. Fit and size are perfect! Worth every penny. I wore them all day and my feet felt great! Very pretty and comfortable too. LOVE these shoes...they are awesome and very comfortable! 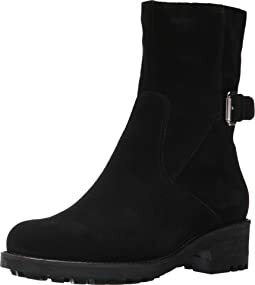 This is my 4th pair of La Canadienne and they are the best most comfortable boot and bootie money can buy. Especially if you have narrow ankles and calves like I do. I bought these shoes to replace a pair that I will still wear for years to come that I have had for 10 years. They just do not wear out! I needed something that looked a bit newer and dresser for an upcoming trip to London and these are great. This brand is more expensive than others but worth every penny. I have never had a pair wear out and they feel like a tennis shoe only stylish. I usually wear a 61/2 in most shoes but always get a 7 in La Canadienne. 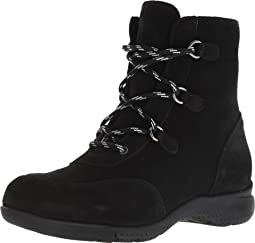 I ordered these boots from Zappos via Amazon and I love this boot. The look, feel and the luxury of italian shearling feels like heaven. However, the right boot has a defect on where the fabric is sewn together underneath causing me pain on top of my right foot. I sent them back to Amazon and reordered them directly from Zappos. This time when I received them I found a flaw on the shaft of the boots. The stitching in not in place, it does not line up and it's noticeable. They feel better than the first pair but for the price I paid this should be a first quality boot. Unfortunately as much as I love, love, love this boot I will not pay for a flawed boot.? I love this feminine version combat bat. Very comfortable. Expensive but worth it. 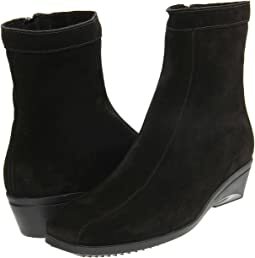 These boots are absolutely gorgeous, but unlike my La Canadienne heels, they have zero arch support. They don't have enough space to get insoles into them either. 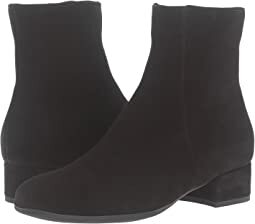 Flat boots should be comfortable, and these weren't for me. I'd rather walk around the city in my heels. But if you find shoes without arch support comfortable, give them a shot. They really are lovely. Let me say, I love these boots. The leather is so soft, they are really pretty, and they are lined with some super soft material. 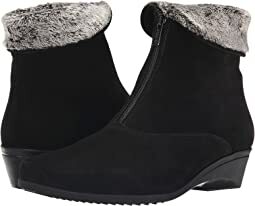 They also *would* have been really comfortable if the pair I received weren’t defective - there was a misplaced nail or something poking up into the sole of the boot, and thence into my heel. Sadly my size is sold out now so I can’t exchange; I like them enough I thought about taking them to a cobbler, but for over $400 I really feel like they should be wearable out of the box. I am so sad, but have to return them, and say that La Canadienne might be a good brand but unfortunately their quality is not consistent. 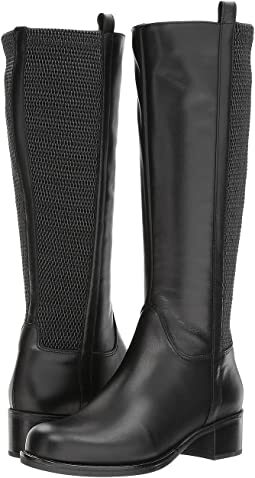 Boots are sleek looking and stylish. 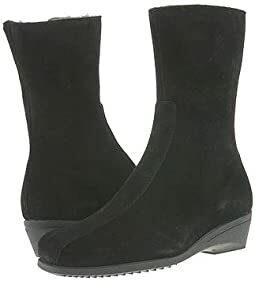 If you have a bunion, or outside foot bone that is painful in other shoes, these boots will NOT cause an issue for you - the suede is soft and their smooth across both sides of your feet, so no pressure points, as long as you get the proper width. These run NARROW. 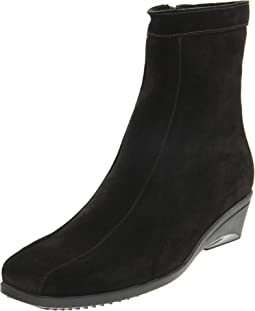 I wear a 8M in all shoes but these; after reading the reviews I ordered the 8WW, (which felt more like a M US width as others had commented and would have been fine for me); however, the length on the size 8 is a full inch longer than any shoe I own. In addition, I couldn't zip them the whole way on my ankle, even with a thin dress sock; I don't have "cankles", people often refer to my feminine ankles. The lining is soft & "bushed"; my daughter who often wears boots without socks, would love that feature because they wouldn't rub her skin. Soles seem as if they'd be slip resistant. So in summary, for me they ran long, and narrow in both width and at the ankle. 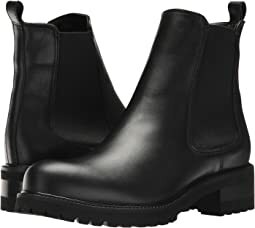 I really wanted to make these work because they're pretty for a warm rain-resistant boot & I need that for a trip to NYC soon. I absolutely love them! I wish they had a brown pair?I’d buy them in a heartbeat!! These fit perfectly (I ordered my usual size). I ordered the black--wish I could also afford to buy the other color, too (a slate grey, I think). They are waterproof, comfortable, and they look nice, which is why I'm willing to spend so much on them. I bought them to replace another pair of La Canadienne ankle boots which I bought 6 years ago and which are now starting to look a little tatty. I love this brand!